Nicely updated home in popular park located in the family section. Recent updates include flooring, paint, outside door, hot water tank (2010), and more. Very spacious layout with nice open floor plan, 2 bedrooms, and a family room or 3rd bedroom. This home is very bright with lots of windows. There is central A/C. 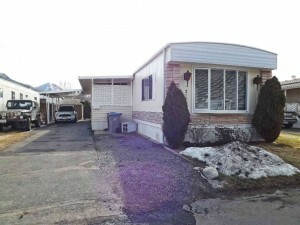 Single car carport and lots of extra parking, nice sized storage shed and small private yard. There is a fully screened in and covered porch. Nice home with all appliances included. Flexible possession.